Are you finding it challenging to locate a great selection of used cars for sale near me at Terre Haute used car dealerships? Well then, you need to make your Terre Haute Auto, your local used car dealership in Terre Haute, Indiana. We have an excellent selection of used cars for sale near me, including used sedans for sale, at Terre Haute Auto. We are committed to providing Terre Haute drivers like you with exceptional customer service and outstanding used cars for sale near me. Our friendly and knowledgeable sales team members are happy to answer any questions you may have on our used cars for sale near me, including used sedans for sale in Indiana, and take you out for a test drive to ensure that it fits your wants and needs. Whether you are looking for used cars for sale near me at used car dealerships in Terre Haute, Indiana because you need it to get to work, to school, or any other number of reasons, Terre Haute Auto has many different used cars for sale near me, including used sedans for sale, to meet those needs. 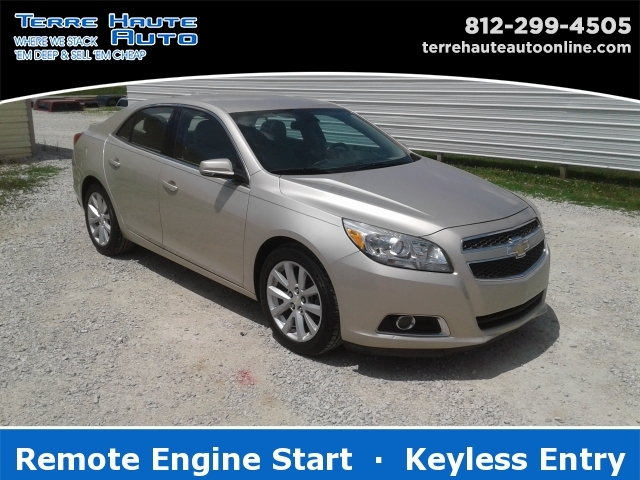 One of our used sedans for sale is a used Chevrolet Malibu LT for sale. This used sedan for sale comes with many features that you won’t want to miss out on while checking out used sedans for sale at used car dealerships in Terre Haute, Indiana. This used sedan for sale offers incredible power in a stylish package. The powerful 2.5-liter engine puts out an incredible 197 horsepower. This used sedan for sale also comes with remote engine start and keyless entry. More great features on this used sedan for sale include steering wheel controls so you can change the radio station and turn the volume up or down without ever taking your hands off the wheel. This used sedan for sale also comes with a wireless cell phone hookup, an auxiliary audio input, and a leather-wrapped steering wheel. This used sedan for sale also comes with many safety features to help put your mind at ease while cruising the streets of Terre Haute. This used sedan for sale comes with electronic stability control, rear side curtain airbags, a passenger airbag sensor, anti-lock brakes, and much more. This used sedan for sale is ready to take on all of your driving needs. Come to your local used car dealerships in Terre Haute, Indiana and see the used Chevy car and even take this used car for sale on a test drive today. If this used car is not what you are looking for come and see one of the many other used sedans for sale at Terre Haute Auto. Call today to schedule an appointment for a test drive at 812-299-4505. You can find Terre Haute Auto located conveniently at 13350 S US Hwy 41, Terre Haute, IN 47802.